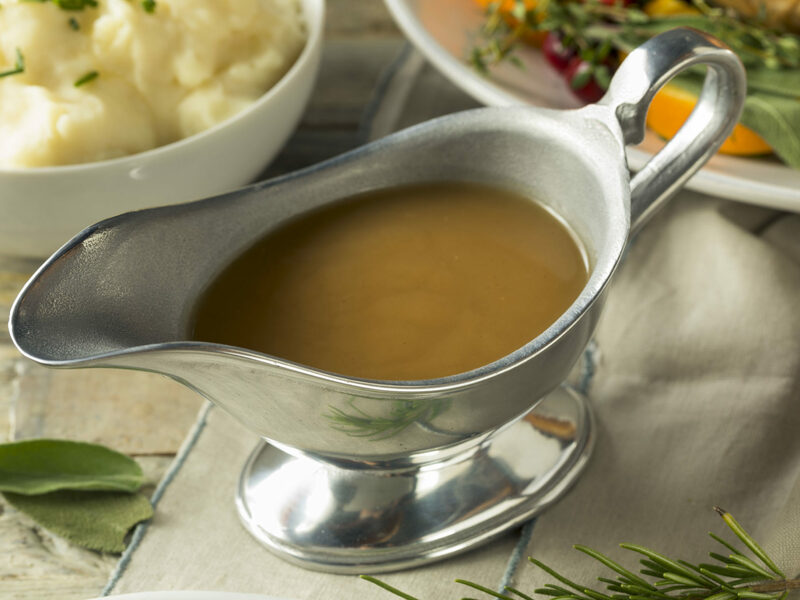 A Thanksgiving meal wouldn’t be complete without homemade turkey gravy to pour generously over your mashed potatoes, stuffing, and turkey meat. Some people opt to make the gravy ahead of time to lessen the stress but then you will not have the wonderful flavor that comes from the pan drippings, flavors that come not only from the turkey juices but from the browned bits stuck to the pan that impart lovely flavor to gravy. And unless you have access to the turkey neck and giblets ahead of time, you will also miss making a flavorful broth from these parts. With just a tiny bit of extra coordination, it is relatively easy and well worth the effort to make homemade turkey gravy at the last minute while the bird is resting and the remaining dishes are heating in the oven. This recipe uses the roasting pan itself rather than yet another saucepan; doing it this way dirties one less pot and takes advantage of the browned and delicious bits in the pan. Add the neck, giblets, onion, celery, water and bay leaf to a saucepan and bring to a boil. Lower heat, cover partially, and simmer over low heat for 1-2 hours while the turkey roasts. Let cool and then strain the vegetables, bay leaf, and turkey parts from broth. Reserve the giblet for chopping and adding to the gravy, if you want. When the turkey is almost done, return broth to heat and bring to a simmer. After you have removed the turkey from the roasting pan to let it rest for 20-30 minutes, skim some of the excess fat from the surface of the liquid that collected in the roasting pan. (You will want about 4 tablespoons of fat left in the pan.) Place the roasting pan over 1 or 2 burners over medium heat. Scrape up the caramelized tidbits, then sprinkle the flour over the top. Stir it well to blend it well with the fat and juices and break up any lumps. Cook, stirring constantly, for 2 minutes. Slowly add the warm stock to the roasting pan while whisking. Bring to a boil and cook, whisking constantly, until it thickens and has a gravy consistency. Season with salt and pepper to taste. If desired, strain through a fine-mesh strainer or add the chopped giblets. Serve immediately.